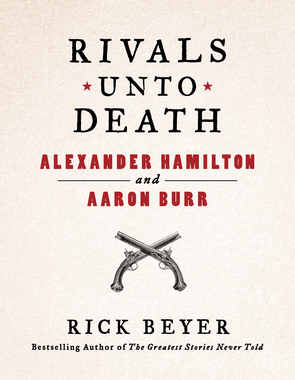 From the bestselling author of The Greatest Stories Never Told series, the epic history of Alexander Hamilton and Aaron Burr's illustrious and eccentric political careers and their fateful rivalry. Rivals Unto Death explores the largely unknown three-decade dance that led to the infamous duel. It traces the rivalry back to the earliest days of the American Revolution, when both men, brilliant, restless, and barely twenty years old, elbowed their way onto the staff of General George Washington; follows them as they launch their competitive legal practices in New York City and through the insanity of the election of 1800 when Hamilton threw his support behind Thomas Jefferson in an effort to knock Burr out of the running for president; and takes them finally to the dueling grounds from which just one would emerge. "They were the best of enemies, two stalwart men of the national stage whose differences—personal and political—seemed to capture larger conflicts churning within our young republic. In this fascinating dual biography, Rick Beyer brings these two towering figures to vivid life on the page. In Beyer's fine hands, the long feud between Burr and Hamilton seems part opera buffa, part Greek tragedy. As the pages keep turning, we feel ourselves pulled along on a collision course—one that still has powerful resonance today."